The BBC have a proven track record, a 60 year pedigree in the Natural History Unit that is second to none and a living legend in front of camera that is Sir David Attenborough. Experience oozes from every individual. All of them expert in what they do. This is why we watch in our hundreds of millions. Unfortunately…, not all experts come with the same pedigree. Whatever you are into, you do not have to look very far nowadays and an expert will be there to give you their “expert” opinion…, whether you want it or not. It is not rocket science, but some “experts” have done a great job of clouding some very basic facts and sentenced neoprene to a life in exile. The information contained within this section of our website has been drawn from our many years in the industry, but more importantly our customer’s experiences and their subsequent feed-back. The people behind this information have a wealth of diving experience gained over decades, much like the Natural History Unit of the BBC, they have earned their reputations and the right to be called experts. O’Three has been listening to customers’ stories and feed-back for over 35 years. These shared experiences means that we can be confident in the practical, common sense advice that we try and share with all our customers. 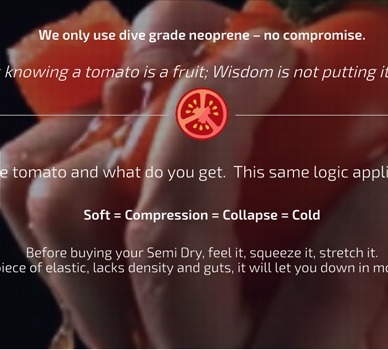 We all need to tell people about our products, but to hide behind marketing that is based on wobbly assumptions is not good for the end user or the future development of this incredible sport. 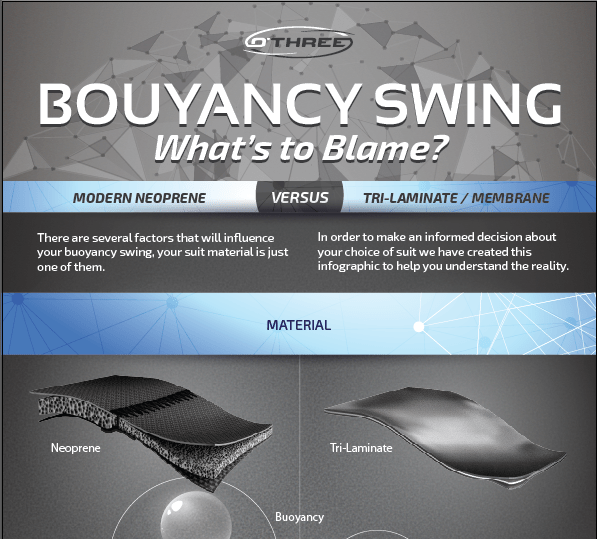 There are several factors that will influence your buoyancy swing, your suit material is just one of them. In order to make an informed decision about your choice of suit we have created this infographic to help you understand the reality. We are currently working on more articles for this section and will add them very soon.